A rare tin fiddle, on loan to the Stromness Museum has been played again for only the second time this century. The fiddle was made by fisherman, James Foubister, of Newark in Deerness, to take to the herring fishing after his traditional wooden fiddle was broken at sea. Now, the iconic instrument - which is still owned by the family - is on display in Stromness by kind permission of Wendy Skidmore of Aberdeen. The last time the fiddle was played was in 2011, after it had been carefully conserved by Mark Shiner. Jennifer Wrigley then described it as being "very easy to play and to hold," in an event during which she also played John Rae's fiddle. 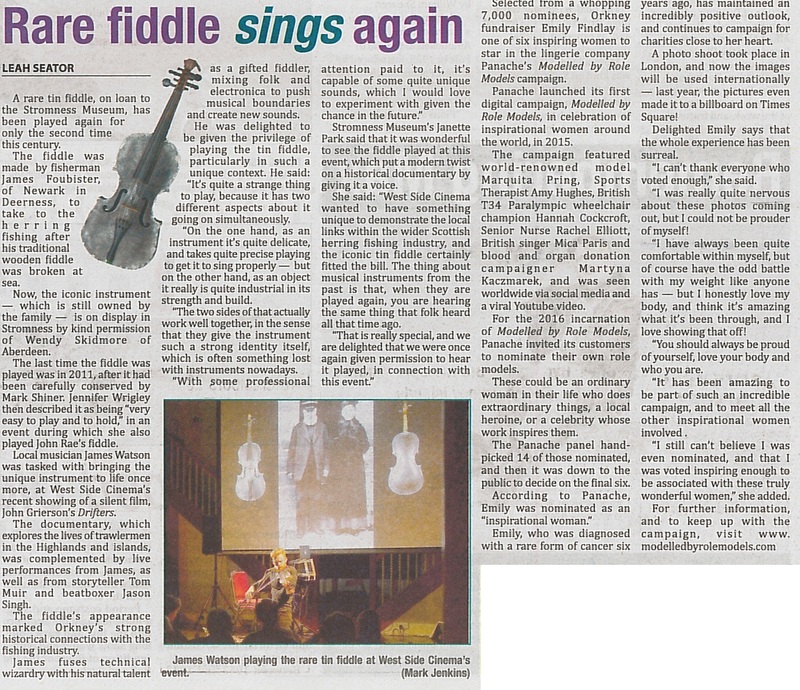 Local musician James Watson was taksed with brining the unique instrument to life once more, at West Side Cinema's recent showing of a silent film, John Grierson's Drifters.